Everyone dreams of being able to jet off on holiday whenever and wherever they like, and Vacation Station is a fun three by three grid format slot game themed around that very desire. Boasting symbols depicting all manner of transport that might whisk players off on their dream break, Vacation Station also includes potentially very beneficial scatter symbols and innovative multi-directional paylines. Vacation Station’s three by three grid format and paylines that extend vertically and diagonally, as well as horizontally, make the game fun and unique. Scatter symbols appear relatively frequently and offer some really impressive potential payouts. 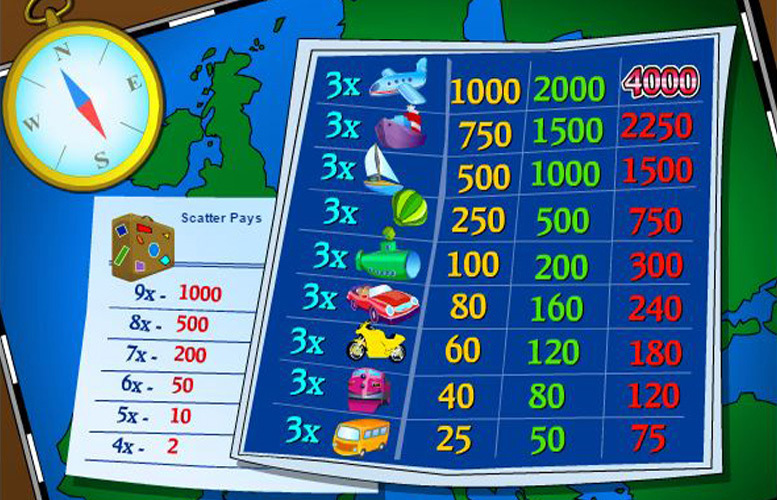 The slots top payline jackpot of 4000 times the player’s bet per line equates to a maximum possible payout of £60000. That’s not to be sniffed at, but is a little bit lower than the jackpots available elsewhere. No bonus game and no other additional features beyond scatter symbols makes gameplay repetitive and a little dull. There are fewer staking options provided by Vacation Station than by most other slots. Rather than traditional reels, Vacation Station utilises a three by three square grid which displays symbols on each of those squares. That allows the game to offer vertical and diagonal paylines, as well as standard horizontal ones. Three matching symbols lining up along any active payline, therefore, represents a winning combination. The most valuable payline combination of all is one comprising three of the slot’s aeroplane symbols. That combination can pay out at a level as high as 4000 times a player’s bet per line, which could be worth £60,000 if that bet is set at the maximum of three coins worth £5 each. It is also worth noting that Vacation Station’s scatter symbols can also deliver a jackpot worth even more than that. If nine of those scatters appear all at once, after all, it pays out at a level of 1000 times the player’s total bet. 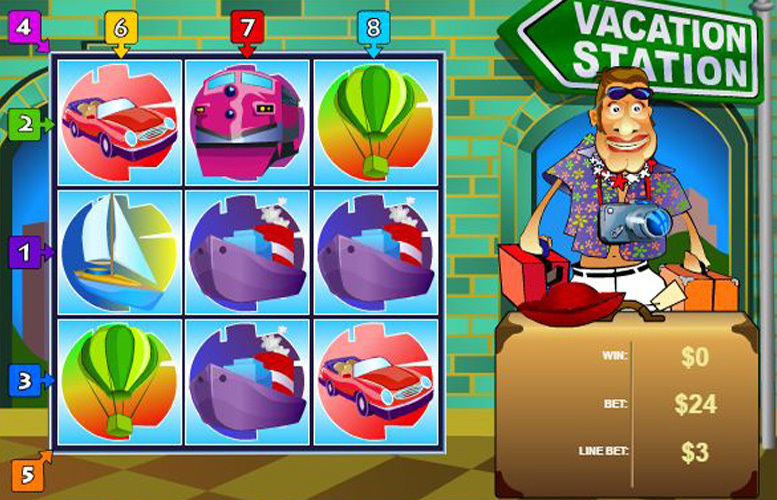 Aside from its innovative three by three grid format, Vacation Station is a pretty simple and straightforward slot. As such, its scatter symbols represent the only real additional features. Depicting a travel worn suitcase, the Vacation Station scatter symbols deliver instant payouts if four or more of them appear anywhere on the slot’s grid at the same time. If a player is lucky enough to see the symbol occupy all nine spaces of the grid at once, the payout will be worth 1000 times their total bet. At the maximum possible bet of £120, then, the jackpot could be worth a cool £120,000! Offering players the chance to jet off on a dream getaway – virtually at the very least – all of the Vacation Station symbols are themed around holidays and the forms of transport that might whisk you off on vacation. The most valuable symbols featured in the game, aside from the suitcase scatters, are those depicting a plane, a ship, a yacht and a hot air balloon. A three symbol combination of each of those symbols can deliver jackpots worth 4000, 2250, 1500 and 750 times a player’s bet per line respectively. In order to control and to alter the amount they bet per spin, Vacation Station players can change three different things about how each spin progresses. Those are how many of the game’s paylines are active, how many coins they bet per active payline and how much each of those coins are worth. When it comes to active paylines, Vacation Station players can choose any number between just one and the game’s maximum of eight. Anywhere between one and three coins, meanwhile, can be bet per payline and those coins can be set at one of six different potential values between 5p and £5. All of that means that the overall minimum possible bet per spin is just 5p and the overall maximum is a much higher £120 (eight paylines and three coins per line, each worth £5). Delivering jackpots that certainly could fund a dream holiday, Vacation Station is an interesting if a little underwhelming slot game option. At face value, the slot’s three by three grid format and the multi-directional paylines that allows for seem like they should make Vacation Station a really innovative and immersive game. In practice, however, the fact that the slot lacks bonus rounds, side games or even wild symbols makes gameplay very repetitive. Whilst Vacation Station’s top payline jackpot of a possible £60,000 is quite generous, too, it is still a little lower than those found elsewhere. A really sizable top potential scatter payout of £120,000, however, does largely make up for that. All in all, then, Vacation Station is a slot which you’re likely to enjoy if you want something simple and straightforward which offers decent payouts. This game has a rating of 3 / 5 with 594 total reviews by the users.